For the Isle of Grain, which the Hoo Peninsula is sometimes mistakenly referred to as, see Isle of Grain. 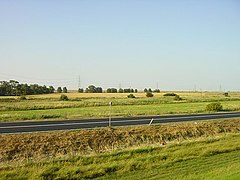 The Hoo Peninsula is a peninsula in Kent, England (United Kingdom) separating the estuaries of the rivers Thames and Medway. It is dominated by a line of sand and clay hills, surrounded by an extensive area of marshland composed of alluvial silt. The name Hoo is the Old English word for spur of land and features in the Domesday Book as Hoe. There are industrial facilities associated with various energy industries. Much of the peninsula lies in one of the Saxon divisions of England called "hundreds": here it is the "Hundred of Hoo". To be precise, the Hundred comprised the parishes and churches of Hoo, High Halstow, St Mary Hoo, Allhallows and part of Stoke. The Isle of Grain, then a complete island, was in the Hundred of Gillingham; the remainder of the parish of Stoke was in the Hundred of Shamel. The Hoo Peninsula is home to a 129.7 acre nature reserve located in High Halstow, one of the many villages on the peninsula, called High Halstow NNR. The reserve is also part of the Royal Society for the Protection of Birds Northwood Hill SSSI site which includes 270 hectares of grazing marsh, woodland and farmland. The area features the largest heronry in Britain, where some 150–200 pairs nest. A heronry has been in the woods from at least 1947, when it was mentioned in a book on the Hundred of Hoo by Ralph Arnold. High Halstow NNR was declared a National Nature Reserve in 1951. The tunnel which passes through large beds of chalk, but to cut engineering costs many sections were not lined, this caused various rock falls between 1957 and 2004. As these rock falls could cause derailment, the tunnel was closed to trains for the duration of 2004 and was relined with reinforced concrete. It reopened in early January 2005. 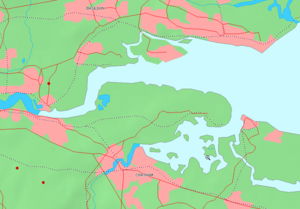 The strategic location of the Hoo peninsula gave rise to the development of a range of industrial and commercial facilities. It has been home to many land-hungry industries, including power stations, oil tank farms, oil refineries, gas plants, explosive works, a container terminal, and mineral workings. Many of these are on the Isle of Grain, but some are, or were, located at Kingsnorth on the south edge of the peninsula, up the River Medway from Grain, and at Cliffe at the western end of the peninsula. 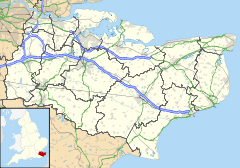 A number of industrial facilities on the Hoo peninsula are associated with the energy – oil, gas, petroleum and electricity – industries. This includes four power stations (Grain, Grain CCGT, Kingsnorth and Damhead Creek); four oil refineries (Medway Oil & Storage Company, Berry Wiggins, BP Kent and Burmah-Total); three oil storage tank farms (Admiralty, MOSCO and BP Kent); two gas plants (SEGAS and Grain LNG); and a submarine power cable from the Netherlands (BritNed). The oil industry was first established on the Hoo peninsula in 1908 when, in association with the naval dockyard at Sheerness, the Admiralty constructed an oil storage and ship refuelling depot at the Isle of Grain. This reflected the Royal Navy policy of building oil-fired ships which were faster, produced less visible smoke and could be refuelled at sea. By 1912 there were 19 oil tanks and two jetties in the deep water of the Medway. The tanks continued to be used until 1950s when they were incorporated into the BP refinery. In 1923 the Medway Oil and Storage Company (MOSCO) constructed an oil refinery and tank farm close to the Admiralty site on a 132 acre (53.4 ha) site acquired from the South Eastern Railway. The site included four groups of oil tanks of various sizes within earth embankments and two short jetties in the Medway. Crude oil was imported from Russia and refined on the site; the petrol was marketed as ‘Power Petrol’; in 1927 it was 2½ d. per gallon cheaper than Shell petrol. There was an oil tank explosion on the site in 1925 that killed three workers. MOSCO was absorbed into the Anglo-Iranian group (later BP) in 1932 after which oil refining on Grain ceased. The MOSCO site was physically incorporated into the BP refinery in 1952. In 1924 Berry Wiggins and Company built a plant to produce bitumen at Sharnal Street on the Isle of Grain. In 1930 Berry Wiggins started the construction of an oil refinery and tank farm at Kingsnorth (TQ817723) on the site of a First World War airship base. At first Berry Wiggins used the wharf at the head of Damhead Creek, but to allow larger tankers to unload in 1937 they built the 1½ mile (2.5 km) Bee Ness Jetty into East Hoo Creek and the Kethole Reach of the River Medway (TQ842726). It was reputedly the longest jetty in Britain. Oil was transferred from the jetty to the refinery through steel pipes on the underside of the jetty walkway. From 1932 oil products were exported from the refinery via an east-facing connection from the single line Grain branch of Southern Railways, the Berry Wiggins branch included three sidings (TQ808735). In 1937 the refinery had an annual oil throughput of 90,000 tonnes, and by 1954 throughput was 65,000 tonnes per year. In 1952 Berry Wiggins built a new two-stage distillation unit at their refinery, and facilities to produce asphalt for road making and other oil-derived products. In 1964 the annual throughput was 190,000 tonnes. In 1973 Berry Wiggins planned to build a new bitumen refinery at Kingsnorth to take feedstock from the adjacent BP refinery and to close its own refinery. However, the 1973-4 world oil crisis prevented these plans being realised. The old Berry Wiggins Kingsnorth refinery closed in 1977. Bee Ness jetty is extant (2019) but is in a ruined condition. Oakham Ness jetty is south of Bee Ness jetty; it was built in 1964 as part of the construction of Kingsnorth power station and was used jointly by the power station and the Berry Wiggins refinery for the import of oil. It is 2 km long and runs across Oakham Marsh to the deep water of Kethole Reach of the River Medway (TQ840719). The long-disused physical connection of the Kingsnorth branch to the Grain branch railway (TQ813739) was severed in 2002. Construction of the BP Refinery (Kent), unofficially known as Grain Refinery, was started in 1950 and the site opened in 1952. It had an initial throughput capacity of four million tonnes per year. A catalytic reformer and aromatics plant were built in 1962. By 1964 the capacity of the refinery had increased to 9,500 tonnes per year. The refinery began to process British North Sea crude oil from June 1975. BP Kent refinery closed in 1982 after which some of the site was taken over by British Gas for a liquefied natural gas facility. In 1957 the South Eastern Gas Board (SEGAS) constructed a catalytic reformer plant adjacent to the BP Refinery to use light distillates (naphtha) from the refinery to reform into town gas. The SEGAS process was a low pressure cyclic catalytic process which used a catalyst based on lime or magnesia to promote the reaction between hydrocarbons and steam to produce town gas. The plant was made redundant when the British gas industry converted from town gas to natural gas during the period 1967-77. The 2,000 MW Kingsnorth power station (TQ810721) opened in 1967 and burnt coal or oil, according to the economics of each. As with others in this area, the site has proved challenging. During building the reclaimed marshland was found to have poor load-bearing properties. Kingsnorth's ground level was some four feet below the highest tide even then, and tide levels are expected to rise another three feet in coming years. For the planners, these disadvantages were outweighed by the proximity to London, the availability of cooling water from the River Medway, and deep-water berthing for oil tankers and colliers. Between 1971 and 1981 the Burmah-Total oil company planned to build an oil refinery on Cliffe marshes (TQ720786). However, the oil crises of 1973-4 and 1979-81 made the project uneconomic and the plans were abandoned. Grain oil-fired power station was constructed on a 100 ha site (TQ886755) for the CEGB. It was commissioned in 1979 and had a projected output capacity of 3,300 MW. The power station was closed in 2015 and was subsequently demolished. Damhead Creek (TQ809728) is a 792 MWe gas-fired Combined Cycle Gas Turbine (CCGT) power station, commissioned in 2001. Grain LNG Terminal (TQ862759) is a facility for the import, storage and export of liquefied natural gas (LNG). It was developed from 2002 and is now a major facility for the British gas supply industry. Grain CCGT power station is a 1,275 MW plant consisting of three natural gas-fired Combined Cycle Gas Turbine units, it was commissioned in May 2010, and cost £580 million. The power station is able to transfer up to 340 MW of heat energy recovered from the steam condensation to run the vaporisers in the nearby Liquefied natural gas terminal. BritNed is a high-voltage direct-current (HVDC) submarine power cable between the Isle of Grain in Kent, the United Kingdom; and Maasvlakte in Rotterdam, the Netherlands. It was commissioned in 2011. Other industries on the Hoo peninsula include an explosives works at Cliffe. This was established in 1900 by Curtis and Harvey Limited on a 128 ha site near Lower Hope Point (TQ715788) to manufacture nitroglycerine, cordite, dynamite and guncotton. The site was expanded during the first decade of the twentieth century and by 1908 was one of the largest in the country. Further expansion occurred during the First World War, although the site closed in 1921. The foundations of the building can be seen in the landscape – centered on TQ724787. A cement works was established at Cliffe in about 1860 using locally mined chalk. The Alpha Cement works was established in 1910 and operated in various guises until 1970. Today the site is an aggregate import, storage and loading facility. Aggregate is offloaded at two jetties (TQ706767) on the River Thames adjacent to Cliffe fort. Aggregate is transferred along a 1.7 km conveyer to the main site (TQ720756) where railway wagons are loaded. Facilities include loading silos, an overhead conveyer and a loading gantry. The sidings are on a branch from the Grain branch railway line. The site is operated (2019) by Brett Aggregates Limited, formerly by Blue Circle. In 1960 BP in partnership with California Chemicals built a petrochemical plant to manufacture synthetic fibres from oil by-products. London Thamesport is a small container seaport in the Port of London on the River Medway (TQ865742) serving the North Sea. It is located on the Isle of Grain. It was first developed as a container port in 1989 and was developed as a deep-water port from 2001. ^ Arnold, Ralph (1974). The Hundred of Hoo. ASIN B0007J0HUC. ^ Warren, Colin; Thomas, Iain (2006). "Geotechnical aspects of the Strood and Higham railway tunnel relining and refurbishment" (PDF). geolsoc.org. Retrieved 29 December 2016. ^ a b "Mockbeggar, Higham". www.britishlistedbuildings.co.uk. Retrieved 26 November 2013. ^ "Mortimer's Farm House, Cliffe and Cliffe Woods". www.britishlistedbuildings.co.uk. Retrieved 26 November 2013. ^ "Fenn Street Farm House, St Mary Hoo". www.britishlistedbuildings.co.uk. Retrieved 26 November 2013. ^ "Isle of Grain Railways", Adrian Gray, Oakwood Press, 1974. ^ Smith, Joanna (2014). "Isle of Grain, Hoo Peninsula, Kent Historic Area Assessment" (PDF). Retrieved 14 September 2017. ^ a b "Historic England - Medway Oil and Storage Company". Retrieved 7 April 2019. ^ a b c "Berry Wiggins and Co - Grace's guide". Retrieved 7 April 2019. ^ a b "Beyond the point, Bee Ness jetty". Retrieved 7 April 2019. ^ a b "Exploring Bee Ness jetty". Retrieved 7 April 2019. ^ a b "Kent Rail - Berry Wiggins". Retrieved 7 April 2019. ^ Jacobs, Gerald (1994). Track Diagrams England South. Exeter: Quail Map Company. p. 7. ISBN 1 898319 07 3. ^ a b Cracknell, B.E. (1953). "The Petroleum Industry of the Lower Thames and Medway". Geography. 37 no. 2: 79–88. ^ "Pastscape: Berry Wiggins refinery". Retrieved 8 April 2019. ^ Newsome, Carpenter and Kendall (2015). The Hoo Peninsula Landscape. Swindon: Historic England. pp. 30–33. ISBN 978-1-84802-225-6. ^ Luckas, M. R. (1965). "Recent Developments in the United Kingdom Oil Industry". Geography. Vol. 50 no. 2: 154. ^ "Isle of Grain SEGAS plant". Retrieved 8 April 2019. ^ Wilson, D. Scott (1969). The Modern Gas Industry. London: Edward Arnold. p. 20. ^ Strood Rural District Council: application by Burmah Total for oil refinery at Cliffe marshes, The National Archives, HLG 156/609. ^ "Damhead Creek acquisition". Retrieved 7 April 2019. ^ "Grain LNG". Retrieved 7 April 2019. ^ "Uniper UK Ltd". Retrieved 7 April 2019. ^ "Britned". Retrieved 7 April 2019. ^ Jacobs, Gerald (2008). Railway Track Diagrams Book 5: Southern and TfL. Bradford on Avon: Trackmaps. p. 7. ISBN 978-0-9549866-4-3. ^ "Brett Aggregates". Retrieved 7 April 2019. ^ "London Thamesport". Retrieved 7 April 2019.